With nearly two million residents, Hamburg is not only Germany’s second-largest city, it’s also the largest non-capital city in Europe, besting Barcelona by a few hundred thousand. And, while it’s only half the size of capital-city Berlin, it’s still a cool half-million more than Munich. All this talk about size is for good reason: Hamburg offers far more than you might realize. First of all, it’s got a youthful energy set against an old-world backdrop. While it has the obvious German perks, like beer and marzipan, Hamburg attracts a young business crowd to counter Berlin’s creative scene, and is home to companies like Google, Facebook, Twitter, Microsoft, and Dropbox. It’s also the country’s media and musical capital (techno and house music, notwithstanding, dear Berliners). Hamburg is the hallmark of Hanseatic port life: It has the canals and bike-ability of Amsterdam and Copenhagen, and is more frequently compared to those cities than any in Germany. You can get turnt upside down in St. Pauli or wake for an early morning stroll along the Alster, depending on your agenda—just save one evening for a buttoned-up show at the new philharmonic. If you’re looking for a long, well-rounded weekend away—and away from overcrowded tourist hubs—make Hamburg your next destination. The Hamburgers have a high standard of living, and they extend the same experience to their very welcomed guests. Here’s where to stay, eat, drink, and sitesee on your trip. The Fontenay: The Fontenay is Hamburg’s most luxurious and secluded stay—an urban resort of sorts. It’s still close to the action, but tucked away into the trees on the west side of the Alster. The hotel’s design may be its most impressive feature. 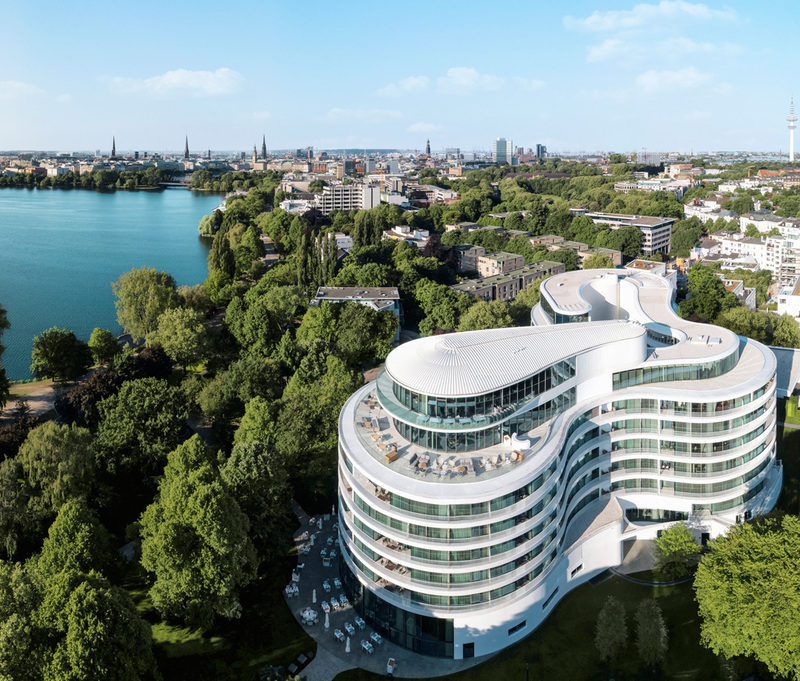 It was built as three large circles that overlap to create towering courtyards, as well as an infinity-like wave of glass that looks out over the tree tops and Alster Lake. You can take a rooftop swim just off the hotel spa, or visit the 320-degree panorama terrace bar for happy hour, mingling with the local “it” crowd. One of Germany’s newest Michelin-starred restaurants is also onsite, the white-tablecloth Lakeside from famed Swiss chef Cornelius Speinle. Boasting all of this and more (not to mention a jaw-dropping, glass-paneled atrium with the most impressive chandelier you’ve ever seen), The Fontenay’s rooms are equally outstanding, with floor-to-ceiling windows, a private balcony, parquet oak-wood floors, and tastefully coordinated Danish details. 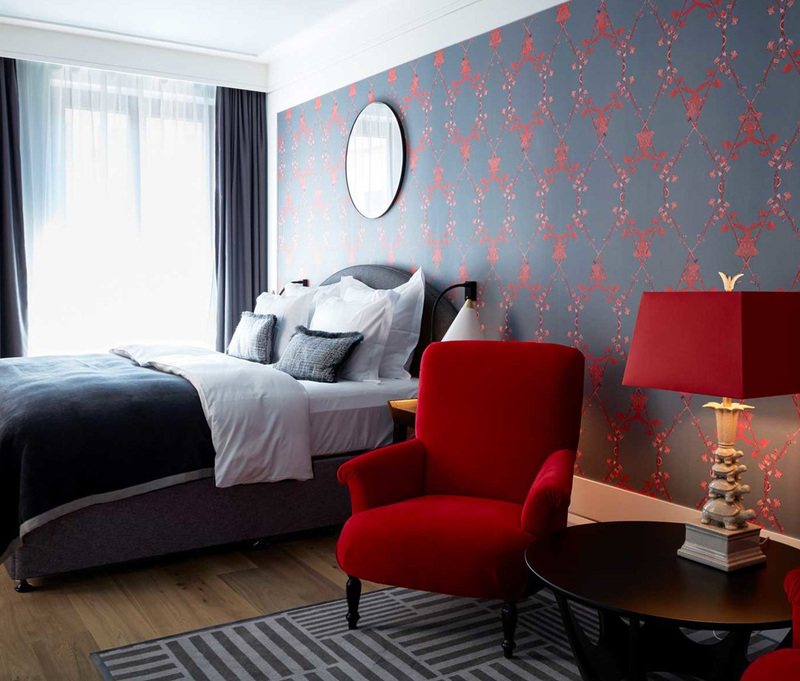 Tortue: Where Fontenay is an upscale urban reprieve, Tortue charms you with its bustling, central location and its too-cute nineteenth-century Hanseatic townhouse frame. 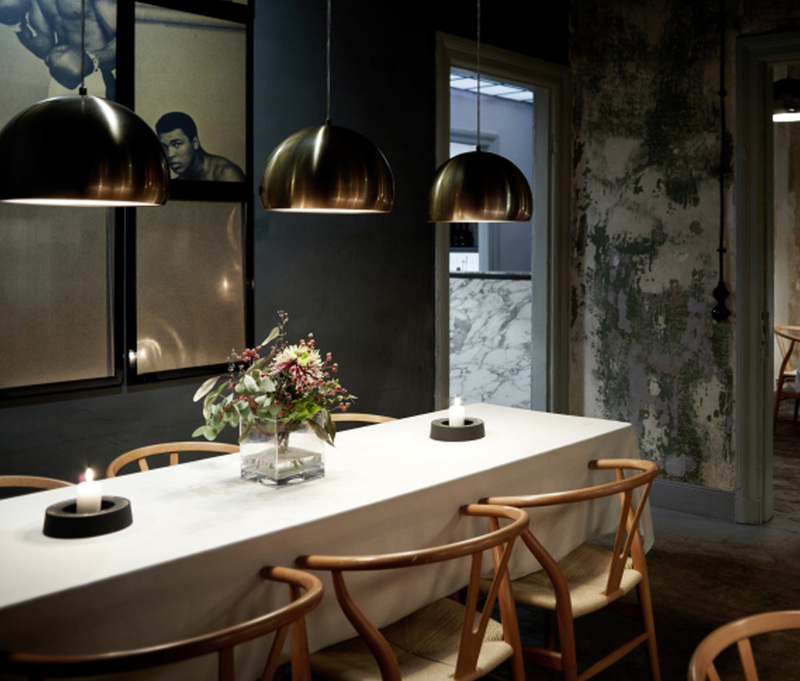 When you enter the Design Hotel, you feel Tortue’s perfect cross section of old-world class and new-world energy. Locals flock to the hotel, be it to dine at Asian eatery Jin Gui and the oh-so-French Brasserie, to have a drink at Bar Bleu with a cigar, too, or host a private dance party at Bar Privé. But then their guest rooms and suites take you away from the bustle, offering private balconies and loads of natural light. All things considered, Tortue is Hamburg’s most on-the-pulse hotel, but it’s neither wound up nor overdone. Elbphilharmonie: The philharmonic, an architectural masterpiece, is the postcard of Hamburg (and it only just opened in 2017). It’s hard to imagine the city without this crown on its harbor, since it attracts talents worldwide and books up well in advance. So, plan one fancy evening around whichever show you can attend, as it’s likely to be the postcard moment of your own visit. Additionally, you can book a visit to the building’s plaza for waterfront panoramic views, if you haven’t any time for a show. Alster Lake boat tour: By day or night, and at length or for a quick trip, carve some time to cruise around Alster Lake, cozied up with wine and your +1. Numerous options are available to suit your tastes. Port of Hamburg boat tour: Yes, you should do two cruises while in town. This one takes you through the canals and the industrial port, as well as along the harborfront. It’s a fresh perspective on Hamburg that you could never see by foot. 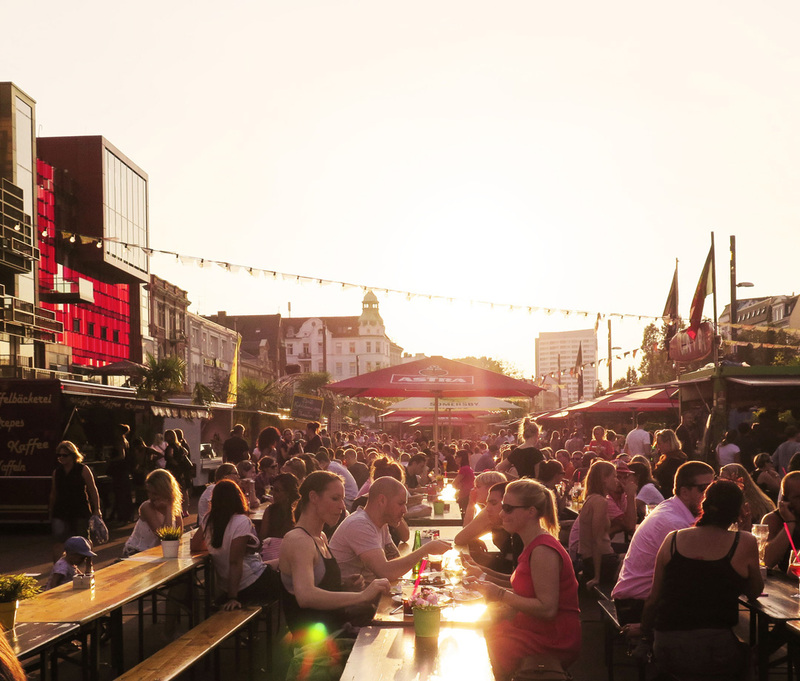 St. Pauli and Reeperbahn: If there’s revelry to be had, go to St. Pauli for your nightlife fix, and meander the Reeperbahn (it’s a street, and a long and devious one). It’s famously Hamburg’s red light district, but offers far more, by way of street fairs, festivals, and bar crawls. Don’t miss the view from Landungsbrücken, the floating dock, and be sure to explore the side streets for quieter (barely) pubs and all the usual vices. Laeiszhalle: While the Elbphilharmonie is the new crown jewel, Laeiszhalle has hosted concerts for over a century—and still does. The more the merrier, especially since the two halls are run by the same company. Laeiszhalle hosts the Hamburg Symphony, in addition to a dynamic roster of visiting artists. Christmas Markets: If you’re visiting during the holidays, Christmastime is when Hamburg really shines. It unleashes markets in every corner, most notably on the Alster waterfront and in front of city hall. Throw down for some mulled wine, marzipan, crepes, and bratwurst. Even the locals will flock to the markets; it’s their favorite time of year, no matter how early the sun sets. Altstadt and Neustadt (Old Town and New Town): These adjacent neighborhoods complement each other well. While Neustadt isn’t all that new (with 17th-century architecture), it does house much of the city’s upscale shopping and fine dining. Altstadt, on the other hand, showcases the city’s oldest buildings, like the Neo-Renaissance town hall (its square hosts Hamburg’s best Christmas market each winter), as well as the ruins of the Church of St. Nikolai. 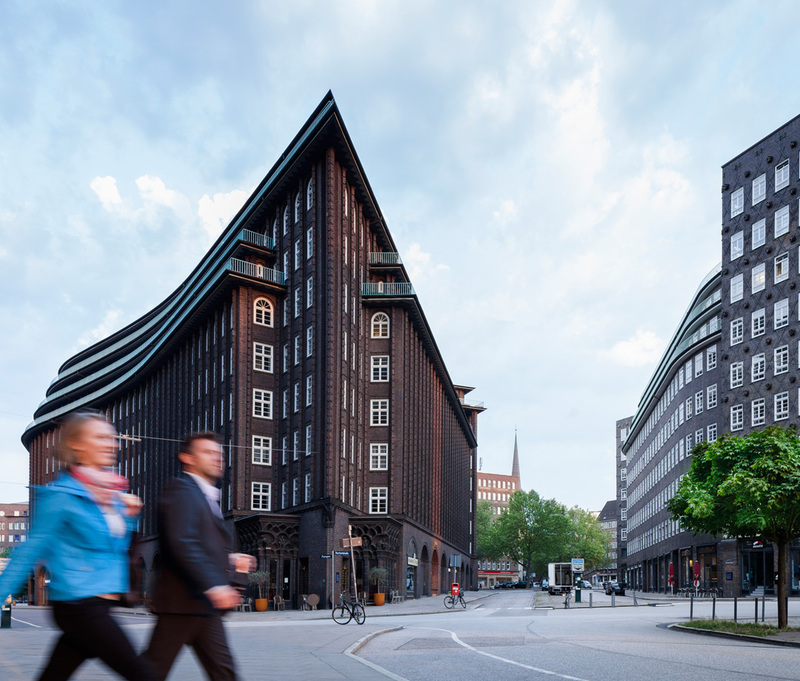 Other highlights are the 20th-century angular Chilehouse, floating church Flussschifferkirche, and the tetris-like Spiegel Publishing House. Churches: Chief among Hamburg’s lutheran churches is St. Michael’s, which towers above the city with its copper baroque bell tower. There’s also the gothic St. Peter’s cathedral with a sky-piercing bell tower, and the St. Nikolai Memorial, a gothic church largely destroyed in WWII. HafenCity: Where Speicherstadt showcases old and preserved warehouses on the canals, neighboring HafenCity has been a study in urban renewal and innovation. 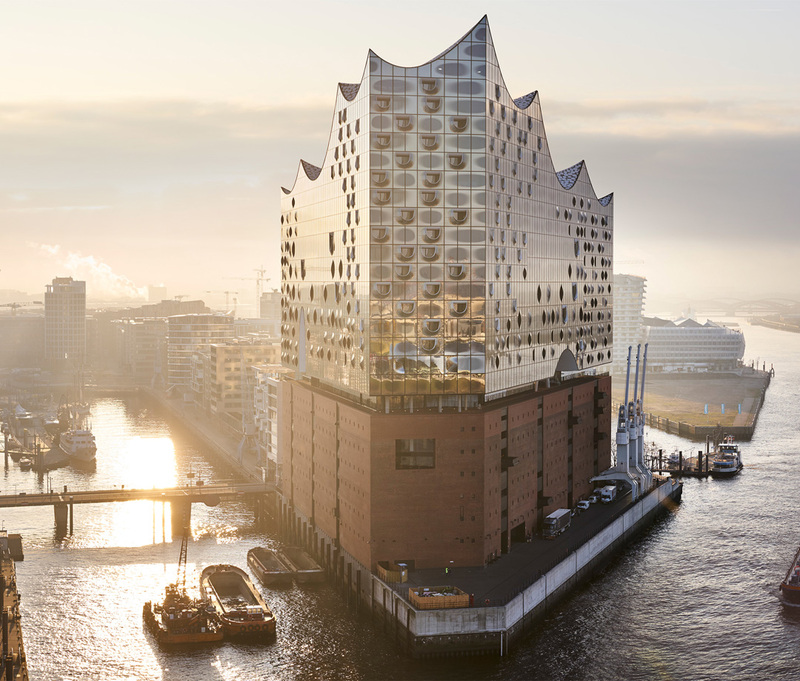 The canal-lined district is home to the Elbphilharmonie and other modern harborfront businesses, restaurants, and apartment, sparing it from becoming a warehouse ghosttown. Speicherstadt and Kontorhaus district (where you’ll find Chilehaus) became UNESCO World Heritage sites in July 2015. 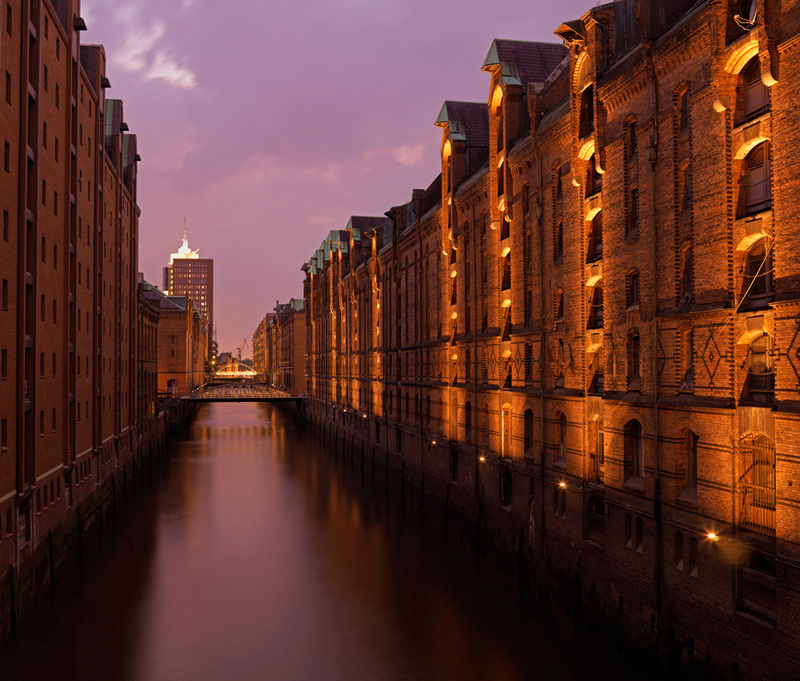 Speicherstadt canals and harbor: This 19th-century warehouse district is the biggest of its kind, but even more impressive is that it’s built into Hamburg’s canals. It makes for a very romantic stroll, especially since it’s lined with cafes, museums, and restaurants now. You can take a detour through it on your way to the Elbphilharmonie or Miniatur Wunderland. Sternschanze: Stay up late with the hippest locals in Sternschanze, which feels something like Haight Ashbury dropped into polished Hamburg. Spend an afternoon hopping between cafes and thrift stores and local restaurants. Miniatur Wunderland: You’re going to have one of two reactions to what is the city’s biggest tourist attraction—despite being so technically tiny: Either you’ll run around with your eyes wide like a kid. Whether model trains, airports, and cities are your thing, give this place in Speicherstadt a shot. It’s a great conversation piece, at the least. KunstHalle: From Middle Ages to modern, Hamburg’s beloved art museum showcases works from many eras. The Table: Boasting three Michelin stars, this HafenCity hotspot sits guests at a single serpentine dark-cherry table. (Limited seating means book well in advance.) Chef Kevin Fehling’s gourmet menu samples flavors from various cultures, like Mexican goose liver or Faroe Island salmon. Diggi Smalls: Easily shared, locally sourced oriental street food. Poletto Winebar: Excellent Italian that doesn’t break the bank—with 350+ wines to pair it with. STANDARD: A reprieve in St. Pauli away from the Reeperbahn, STANDARD celebrates Italian Stuzzichini culture (wherein drinks are paired with small, delicate bites that can only be eaten with toothpicks). Schoppenhauer: Cozy ambiance, and comforting German fare in a 17th-century house. Gröninger: Craft beer and cuts of meat. What’s better than suckling pig and Helles? Bullerei: Meat stacks on stacks, converted from an old slaughterhouse. Jolly Roger: If you want to drink alongside the rowdy—but friendly—fans of F.C. St. Pauli (the city’s professional soccer team), come to this boisterous St. Pauli pub on game day. You might want to arrive a couple hours early, though, to claim your spot. Lübeck: Another Hanseatic staple, port-town Lübeck is adored for its red-brick gothic architecture. However, that’s not its only draw: Lübeck also serves Germany’s best marzipan. It’s just 45 minutes by train from Hamburg center. Bremen: Germany’s eleventh largest city plays second fiddle to Hamburg in the north, but it’s just as jaw-droppingly beautiful, thanks to its Hanseatic roots. 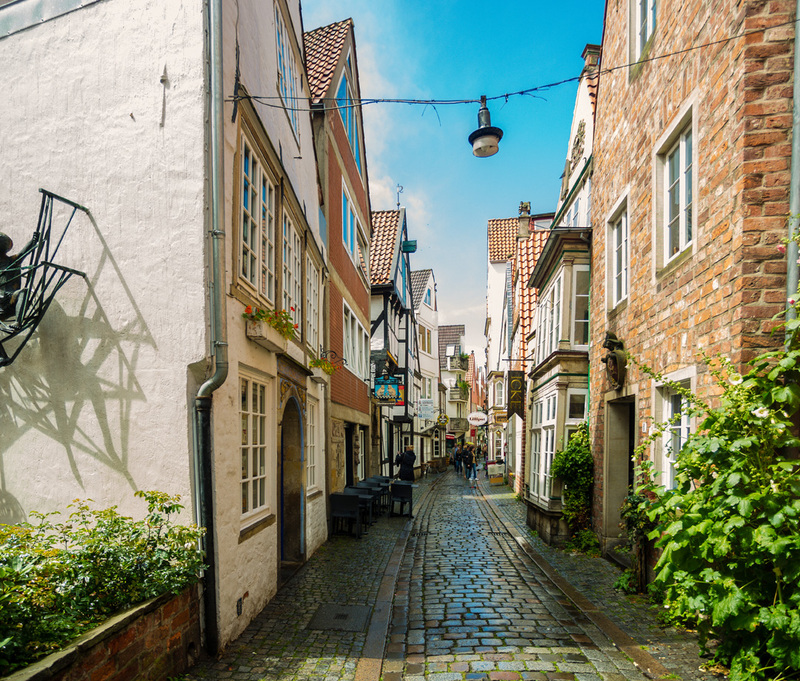 Meander its streets in search of Bremen’s many art museums and galleries, like Übersee-Museum. It’s only an hour and a half by train each way. Schwerin: “The land of lakes” is just an hour from Hamburg by train, and no trip there is complete without a visit to Schwerin Castle.